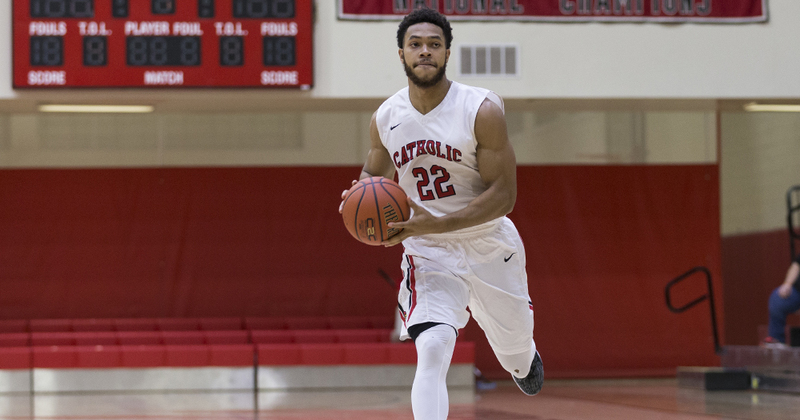 The Catholic University of America Men’s Basketball team won a pivotal Landmark Conference matchup against the Scranton Royals 81-79 on Saturday, February 10th. The road win leapfrogged the Birds over the Royals into the fourth and final spot of the playoffs with only two games remaining in the regular season. The team was lead by the tandem of Jay Howard and Jimmy Golaszewski, who combined for 53 of the team’s points in the win. The Cards found themselves down early as they faced the reigning conference champions, with a 13-point deficit of 48-35 at the half. The team played a much different second half, however, battling its way to a lead of 76-75 with under four minutes remaining. The Royals managed to tie the game at 77, but Howard, who leads the team in scoring on the year, responded immediately with a lay up to regain the lead. Scranton still had some fight left as the clock wound down and tied the game once again with only 12 seconds left. Howard once again came in the clutch for his team as he hit the two go ahead free throws to seal the victory. Howard led the charge for the Birds as he dropped 32/3/2 with 5 steals and 2 blocks on the Royals. Golaszewski managed to break his scoring slump as he came through with 21 points with 4 treys in the win. The junior also grabbed 5 boards and registered 2 steals on the day. Guard Andre Mitchell also scored double digits with a stat line of 10/1/4. Sixth man Brandon Easton was the fourth and final double digit scorer as he posted 13/2/2 off the bench. The win brought the Cards to a 13-10 (7-5) record and won them the season series over the Royals, who can still play the spoilers for Catholic’s playoff hopes. The Royals sit at a 11-12 (7-5) record and can unseat Catholic if they defeat Goucher (0-23 overall) and Catholic loses to top seeded Moravian. The Birds own both tiebreakers however, with 2-0 advantage in regular season matchups and a better overall record. The CUA team has since played one game against Elizabethtown, where they squeaked out a 74-72 victory over its conference opponent. This brings Catholic’s record to 14-10 (8-5) with only one game remaining before the postseason. The team’s final regular season matchup is this Saturday, February 17th, as it hosts the Moravian Greyhounds in the DuFour Center. Moravian boasts the best record in the Landmark Conference with 18-6 (10-3), and bested CUA 105-103 in overtime the first time the teams met. Catholic controls its own destiny this weekend and will have one final obstacle to hurdle if the Cardinals want to play on.